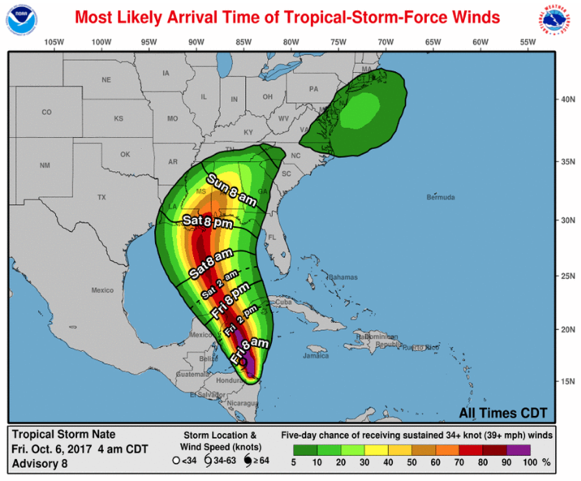 · Tropical Storm Nate is currently southeast of the Yucatan peninsula and moving NNW. 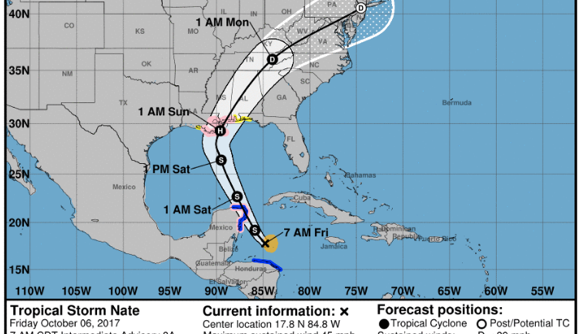 · Hurricane and tropical storm watches, as well as a storm surge watch, are in effect for a portion of the northern Gulf Coast, and residents in these areas should monitor the progress of Nate, heeding any advice given by local officials. o New Orleans is especially vulnerable to flooding and interruption to service as a result of this storm. Currently, we are only anticipating temporary impact to flight operations starting Saturday night and extending into Monday morning. If you have a flight scheduled or are planning on traveling near the impacted areas this weekend, be sure to contact our Flight Support Team by calling 877-550-JETS (5387) for more information on how Tropical Storm Nate will affect your travel.